Narnia fans, rejoice! There’s a new storyteller in town and the tales are almost familiar. Almost. The rescue operation is complicated by the fact their hated stepsister fell into this other world with them. It’s her first trip to Aedyn and she doesn’t like it one bit, a fact she never ceases to mention. Loudly. Young Louisa is a whiner with an unfortunate tendency to faint. She hums. She eats everything in sight. If you were picking teams for an adventure (like picking teams for, say, dodgeball), Louisa would be the last one you’d choose. Nevertheless, Peter and Julia are stuck with her, so off they all go to save the world. 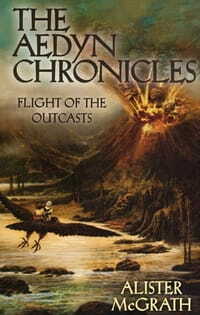 Flight of the Outcasts is book two of the Aedyn Chronicles; it marks Peter and Julia’s second visit to Aedyn. We know this because the book refers to their earlier adventure constantly, with maddening references that are never fully explained. Clearly, the first book is considered required reading before diving into volume two. Flight sort of stands alone ... but not really. Alister McGrath’s style is delightful; he’s a very British storyteller in the best sense of the word. Reading the book’s opening chapters felt like visiting an old friend for a cup of tea and a cream scone. His writing is charming and evocative, which makes it even more of a shame the rest of the book didn’t live up to its early promise. Alas, the character development was implausible, even for a fantasy-based young adult story. In fact, it wasn’t really “development” as much as magical overnight change from bad to good. Surely a bit more struggle is required to turn someone from horrible to healer? I wasn’t impressed with the story’s “God” character, the “Lord of Hosts,” either. He was only vaguely present and not terrifically helpful when he sort of showed up. The plot started out well enough, but the ending ... wasn’t a proper ending at all. It put me in mind of The Empire Strikes Back—acceptable as a connector from A to B, but not what you’d call satisfying on its own. The story seemed to lead up to a big moment that never happened. Not, at least, until book three, when I assume the tale will pick up where it left off. My advice is to wait until all the Chronicles have been published, then buy the whole set and read them back to back. I have a feeling the whole will be greater than the sum of its parts.